Join Winterthur for a film series featuring intriguing documentaries surrounding real-life tales of forgery and counterfeiting, hosted by experts involved with the cases. This week, they&apos;re featuring Sour Grapes - the story of a young wine savant cons wine enthusiasts out of millions of dollars. Followed by a Q & A with special investigator Brad Goldstein. Celebrate sunny days at Brandywine Creek State Park&apos;s Annual Kite Day. You and your family will usher in springtime by enjoying the weather, music and the sight of flying kites. Bring your kite or decorate one of their make-your-own kites for free! 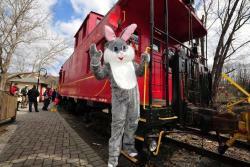 The Easter Bunny hops aboard the Wilmington & Western Railroad for a 1½-hour round-trip ride to Ashland, and all kids will get a special treat. Bring your camera and have the Easter Bunny pose for a picture with your child. Reservations Recommended! Experience Deerfield&apos;s 111 feet of brunchy goodness, and meet the Easter Bunny! Reservations required.